We had another fine list of exhibitors for this year's event, with many exhibiting a variety of wares. All items were made by the artist themselves, most of whom accept commissions. So remember that, if you saw something you liked but want it a bit differently, or have something special of your own design in mind, you only have to ask. 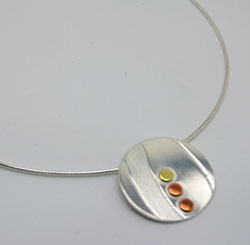 Fine jewellery made in silver, often incorporating enamel or gemstones. Ian produces an eclectic range of high quality fine jewellery, usually in sterling silver, and using many traditional techniques from delicate piercing to casting and smithing. His enamels are traditional, kiln-fired vitreous enamels. 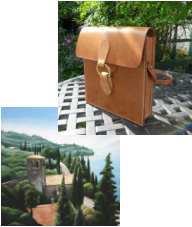 Paintings and leather handbags, shoulder bags and purses. Made from bark tanned English leather and assembled without the use of any machinery, Simon's unique leather goods combine the best of traditional craftsmanship with modern ethical values. 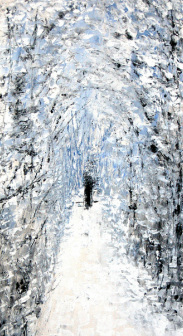 He will also be exhibiting paintings of landscapes in England and Italy. Angela creates unique jewellery in sterling silver using acents of brass and copper. She has been making jewellery for a number of years and has built a reputation for high quality handmade pieces. Angela exhibits at leading Yorkshire art & craft events. Bookmarks, cards, calendars, prints and canvasses. Andy is surrounded by hills, moors, trees, rocks and rivers. He tries to photograph these in the best light and time of year, striving never to take the same photograph twice. A Chemical Engineer by profession, Paul Davies took early retirement in 1999, and studied Cabinet Making at Leeds College of Art and Design. He now designs and makes mainly oak furniture in his home workshop in Silkstone. His principal design influences are Charles Rennie Mackintosh and Ernest Gimson. 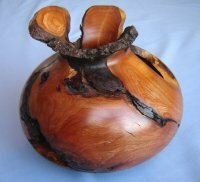 He has contributed articles to “Woodworking” and “Woodworking Plans and Projects”. 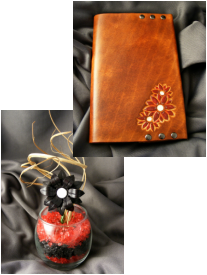 Items designed, hand cut, tooled and dyed from veg tanned leather. Jewellery, decorative flowers, key rings and notebook covers. CJ tells us: "I enjoy creating. Some designs are planned; others are more spontaneous! Working with leather allows me to experiment with colour, shape and texture. I’m currently working on a new flower jewellery range and a commission for 3 dragon-themed notebooks." Cheryl studied Art at Huddersfield University and gained a BA in Art and Design. She now teaches Art and Design to students in schools. Her work is inspired by the countryside, colour and texture and, at the moment, she is portraying this in her paintings and textiles. Framed & unframed photographs, etchings, paintings and drawings. Silk ‘Flame’ bowls & hand made paper for crafters. Angela is inspired by urban architecture and takes photos with an unusual slant. She is currently working with a civil engineer on a leaflet/book for a civil engineering trail in Sheffield. Experimenting outside of the box, discarded objects appear in her varied art. Lisa and her sister Sally - two Yorkshire Sisters - were inspired to create a collection of original textiles and crafts by their love of all things handmade. Their aim is to support local suppliers, arts and craftsmen to encourage environmentally responsible trade. Paintings, drawings and prints of animals. Some limited and open edition prints. Jane is an established, internationally-exhibited artist, specialising in equestrian and animal art. She's just completed a '100 paintings in 100 days' personal challenge which can be viewed at her blog. Booking now for Christmas commissions of your own animal. Bob and Judith both 'pot' away. 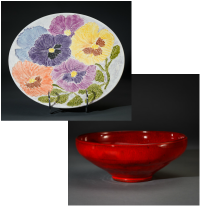 Over the years, Bob has developed his own vibrant fire-like glaze, while Judith loves floral designs and specializes in the technique called tube-lining. Sabine works with lampwork and cold working techniques to create a variety of glass jewellery and sculptural pieces. Her range of interchangeable Alcazar jewellery showcases the strength of versatility in modern times, whereas the Wordsmith series is inspired by her love of words and their impact on people. She is drawn to natural, organic forms in her sculptures, often mixing glass with living plants, such as her air plant or glowing moss pieces. Victoria has been silver-smithing for over 10 years and her work is sold in a number of small shops and galleries around the UK. Birds" ranges will be available to buy, together with some one-off designs made specifically for this event. Gwenda has been painting in watercolours for several years and is constantly trying new and exciting ways of introducing movement and atmosphere into her work. Darrel is a studio potter specialising in functional and sculptural ceramics. Since finishing his degree, he has been designing and developing his own range of functional products. His work incorporates his own glazes and finishes based on traditional high quality ceramics. Alison enjoys working with tactile media. 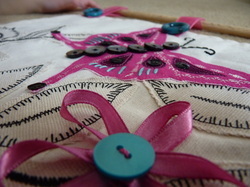 Her current project is 'Kitsch and Stitch': a range of accessories made with beautiful cotton fabrics. Her inspiration comes from her surroundings on the edge of the Peak District, memories of the 6 years she lived in South Texas, and from old prints & ceramics. Limited-edition prints and photographs, greetings cards. Yvonne is a contemporary landscape artist who uses digital photography, mixed media and collage. 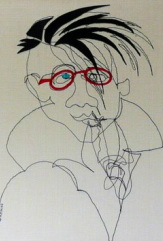 character of ordinary people expressed through work on paper, fabric and canvas. High quality sketch-books are covered with unusual and exotic fabrics and presented in gift-boxes. Silk pouches are hand-stitched and also presented in gift-boxes. Sculptures in metal and wood, and decorative metal trays. After years of welding as an occupation, Edwin turned his attention towards producing works from his imagination. Inspired by the art of far-away places, he has had success in the Sheffield Art Show, and in private commissions. working on the outskirts of the Peak Park. 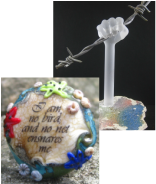 She works with stained and fused glass, using leading, foil & kiln forming techniques to create functional objects, windows and sculptural pieces inspired by nature. community artist and worked freelance since 1980. Her work has been exhibited in France, Italy and England and she was chosen to represent her country at the world comics convention in Angouleme. Pat enjoys using all media, but , in the last 3 years, has concentrated on painting on silks, using resists such as gutta and spray-starch. She is now using newspaper as collage under her silk paintings. 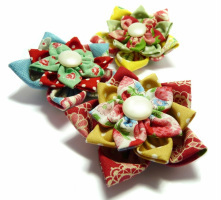 Folded felt accessories, gifts and homewares – including brooches, rings and hair decorations, pin cushions, keepsake gift bags, cushions and lavender scenties. Laura creates colourful collections of contemporary accessories - all made from folded felt! Handbags, covered books, accessories, hot water bottle covers, tea cosies and cushions. Sharon's works is created from recycled and vintage fabrics, unique and individual handbags and fripperies. Made in response to a collection of very old photographs, reproduced onto fabric the photographs complement the materials and embellishments. Codgerbags are handbags and accessories with a narrative and a little history sewn in. Paintings in watercolours & inks. Josie has been painting for most of her life. She is self-taught. Always changing styles and media, her latest works are predominantly inks. These are very vibrant and different. 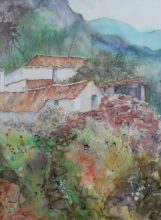 She teaches watercolour painting, and has exhibited in Bawtry, Sheffield, Holmfirth and at the Cooper Gallery in Barnsley. Turned wooden items including bowls, tealight holders, vases, stools, chopping boards and ring boxes. John uses mainly English hardwoods sourced from many different suppliers, gaining satisfaction from creating something of beauty from knarred and unlikely looking pieces of wood. Framed and mounted photographic images. Fascinated by those small and often overlooked corners in the city where nature is asserting itself, Kath's images seemingly tread a line between painting and photograph. She aims to reflect the beauty and fragility of these wild places.